This is the reverse of the poster. 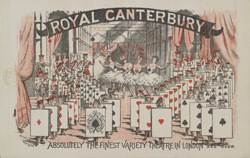 The Royal Canterbury, or Canterbury Hall as it was first called, was opened in 1851 by Charles Morton on the site of an old skittle alley adjacent to his Canterbury Tavern. The Hall was immediately popular and was reconstructed twice, firstly in 1854 to form the much larger New Canterbury Music Hall and secondly in 1876 to create a three-tier theatre with entrance hall, promenade and lounge. Many well known artistes performed at the Canterbury Music Hall. Among them and featured here was Bessie Bonehill (1855-1901), a male impersonator with a clear and powerful voice who became famous for her patriotic songs such as ‘Here Stands A Post, Waiting For The Signal’ and ‘The British Tar’. Also listed is Mr Albert Chevalier (1861-1923), who in 1891 was at the start of a long and outstandingly successful career in the English music hall. He was to become immensely popular as a fine singer of Cockney songs and is still remembered for such pieces as 'Knocked 'Em In The Old Kent Road', 'It Gits Me Talked Abaht' and 'My Old Dutch', the words of which he wrote himself.